PAC-MAN has a long history, and has been around for longer than many people who will be reading this will have been alive, and now the pill munching yellow maniac finds himself in a third Windows Phone outing, and this time he is on wheels. 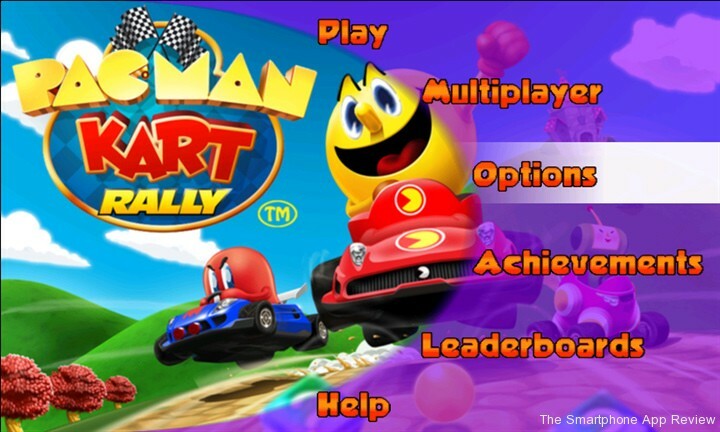 PAC-MAN Kart Rally has been on the Sony Xperia Play for a little while now, and although this release obviously drops the physical controls, it does have a little ace up its sleeve; it is the first Xbox Live game for Windows Phone with local multiplayer. Incredible when you think about it really, as surely the very heart of Xbox Live has to be multiplayer, but there has only been a couple of turn based online options for Windows Phone owners wanting some Gamer Points to get their teeth into. The multiplayer itself OK, with up to four players on a WiFi connection. 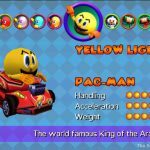 It is a shame then, that PAC-MAN Kart Rally has so many problems, because this could have been a decent first multiplayer title. The first thing that will strike you when booting the game up for its maiden voyage is the bizarre lack of sound. It is switched off by default. The reason soon becomes horrendously obvious when you switch the sound on; the music that plays both in the menus and in the first cup’s batch of tracks is hideous. It is a remix of the classic PAC-MAN game start tune, but repeated hundreds of times with no changes, and it is terrible, just terrible. It is compounded by the fact that there are no engine noises or character sounds. All that is here in terms of sound effects are some beeps and skid sounds. Luckily, just when you are about to throw your phone against a wall, you unlock the second cup, which has music that is far less offensive. In fact, each cup has a different music track, so why they couldn’t have made the music choice for each race random, or at least turn that damned track off in the menus, I don’t know. The fact that they turn the sound off by default tells us that they know it’s a problem. Onto the game, which sees you take control of a few different Namco characters, so as well as PAC-MAN and the ghosts, there are also guys from the Katamari games and Dig Dug, as well as a couple of cool secret characters to find. 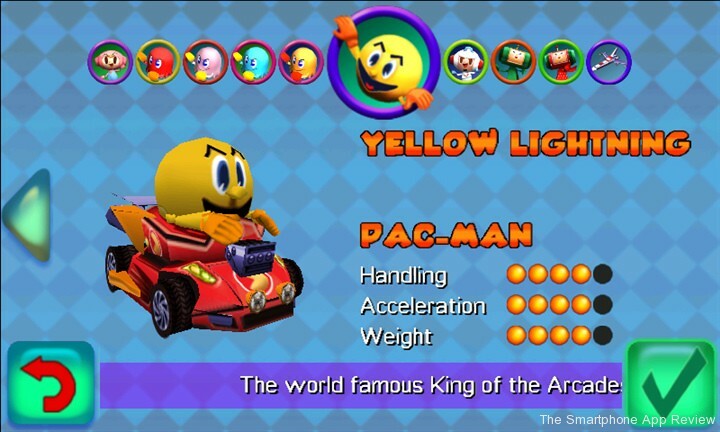 Each character can be teamed up with a variety of karts, which is a nice touch that adds a hint of customisation to the title. You can choose either tilt or touch controls, and with the tilt option being an exercise in frustration, the touch option does fare better, although the arrow to turn is a little bit too close to the Windows ‘home’ button, causing some accidental exits. Luckily, the game multitasks properly so it’s not a huge issue. 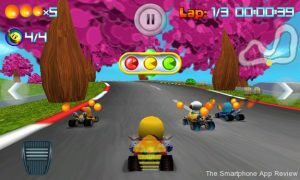 The game allows you to jump over objects with a slightly awkwardly placed button, and there is the usual array of collectibles to find and use against your opponents. You can also collect pills to increase your overall speed. 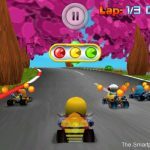 There are plenty of tracks, with the later efforts proving to be the strongest, and there are plenty of shortcuts to be found on many of the levels, which the CPU opponents will use to their advantage. As well as the usual cups, there are plenty of other modes to play, including a Mirror Mode, an elimination style Survival Mode, a Time Trial, and the best two modes, Challenge and Chase. 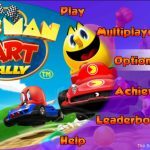 Challenge lets you tackle a variety of different tasks on the levels and chase plays a little like a race based proper PAC-MAN game. The graphics are pretty good, with some nice looking tracks and fairly nice characters. So, aside from the music, it looks half decent, there are plenty of modes and loads of characters and tracks, what could go wrong? A lot, as it turns out. First off, the game doesn’t have any real feel to it. You just feel like you are floating along the track, going through the motions. As a racing game, it is just very dull, with no excitement or thrill. The second big problem is the frame rate, which is just a bad joke. When each race begins, the frame rate is teetering on the edge of a cliff, and once things gets going, it takes a nose dive straight to the bottom of the cliff, where a big fat ‘unplayable’ sign is stuck into the ground. 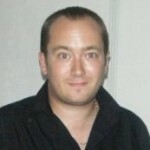 We tested it on three handsets, a HTC HD7, a Lumia 800 and an Omnia 7 with the same result. Strangely enough, when playing modes where there are no other cars on the track, the frame rate improves. When you combine these three things, the terrible music, the empty gameplay and the non-existent framerate you have a poor game. Yes, the sheer amount of options and modes, and the generous track and character roster do count for something, so believe me when I tell you they do stop the score below from nosediving into the same territory that the framerate can be found in.